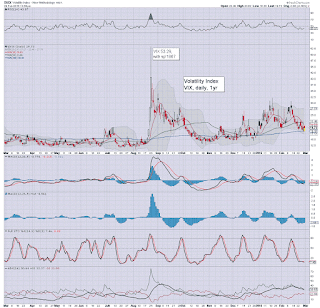 With equity indexes closing moderately weak, the VIX was naturally a little higher, settling +3.7% @ 20.55. Near term outlook threatens renewed equity upside, and that will likely equate to VIX back in the 18s, if not the 17/16s by the end of the week. 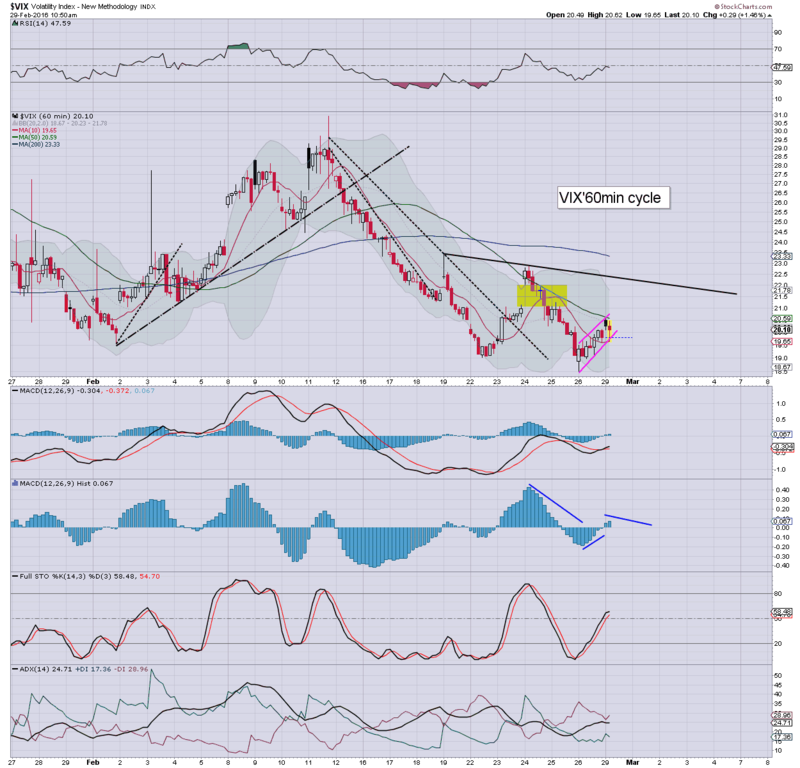 VIX looks set to remain broadly subdued for another few weeks. The 30 threshold looks just about in range by end month... if a March close under sp'1900. 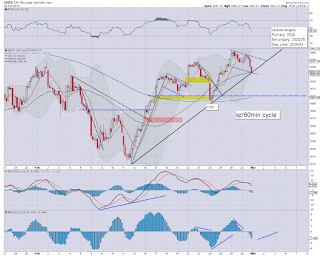 US equities ended the month on a moderately weak note, sp -15pts @ 1932 (intra high 1958). The two leaders - Trans/R2K, settled lower by -0.8% and -0.3% respectively. Near term outlook offers renewed upside, at least to the 1970/80s later this week, with the 2K threshold more viable next week. *closing hour action: moderate weakness, with a new intra low of 1931, but holding first soft support of the lower hourly bollinger. 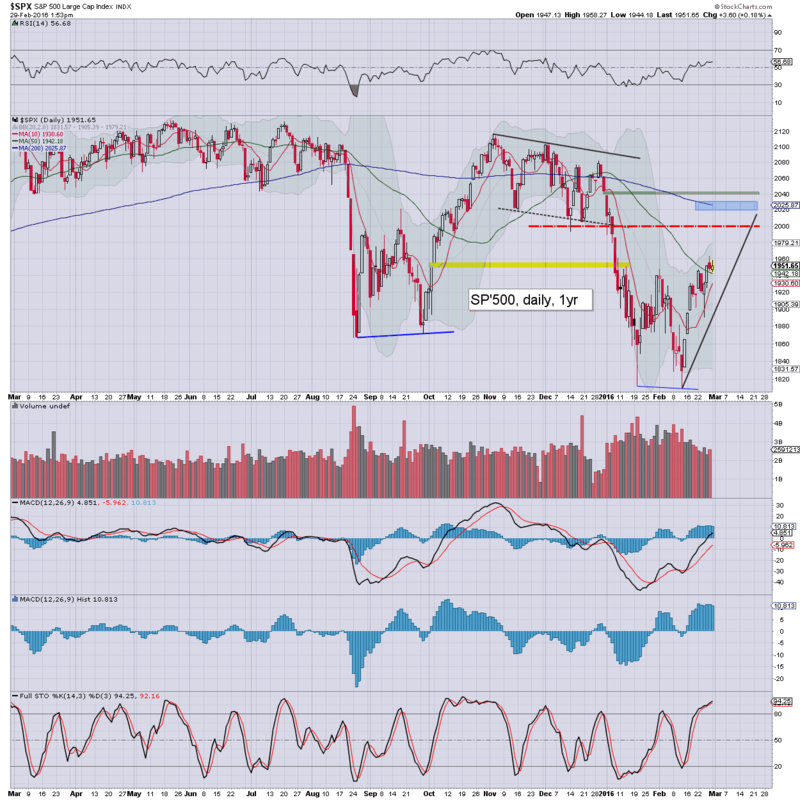 Price structure is still arguably a bull flag... if somewhat bigger. ... and February comes to a close. We saw a marginal lower low in the sp'500 of 1810, before swinging powerfully higher, having already hit 1962.. with VIX cooling from 30 to the mid 18s. Broadly, the market still looks set climb into mid March... and once the next ECB and FOMC are out of the way, the equity bears will have an open window to break the market much lower. yours truly remains quietly watching. 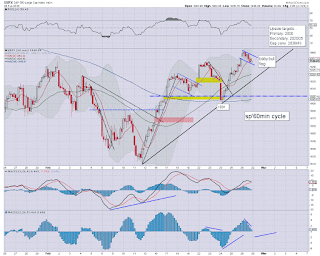 US equities have seen a minor wave lower, but it does nothing to change the broader outlook into mid March. 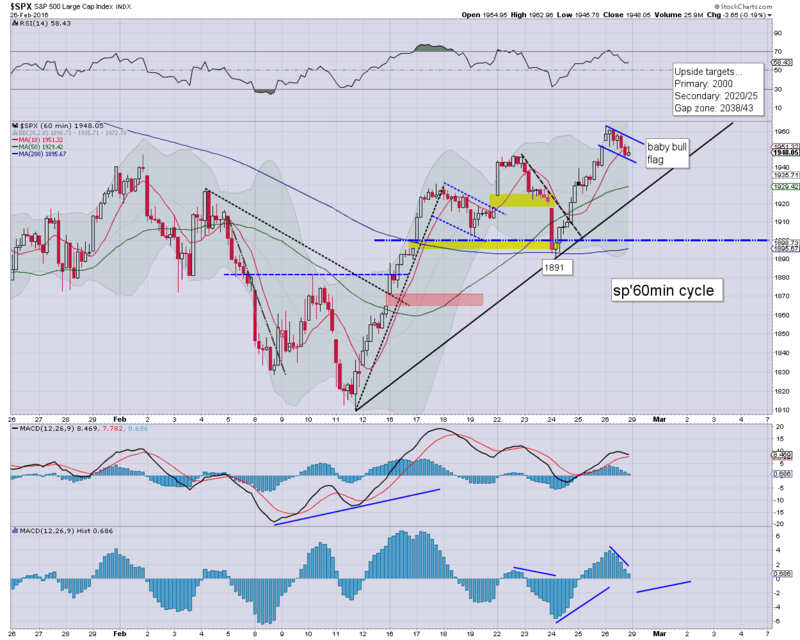 It is notable that first support is the hourly lower bollinger, and that is currently at sp'1928.. and rising each hour. There is little reason to expect any sustained price action <1930 in the near term. 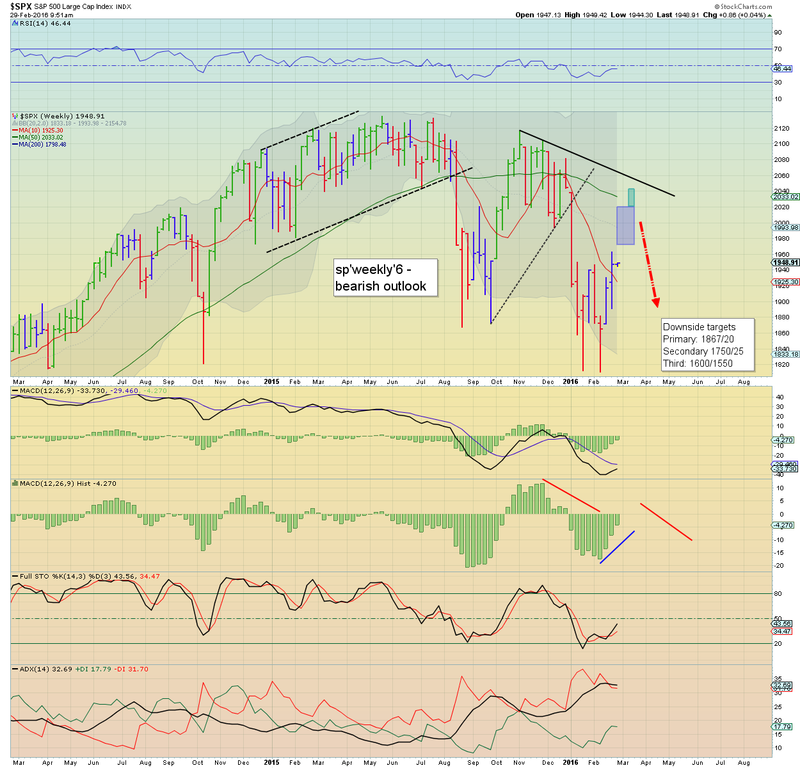 Despite cooling from the morning high of sp'1958 to 1940, there is little reason to expect we have a short term top. Price action remains broadly subdued, and is arguably mere consolidation before another push higher. 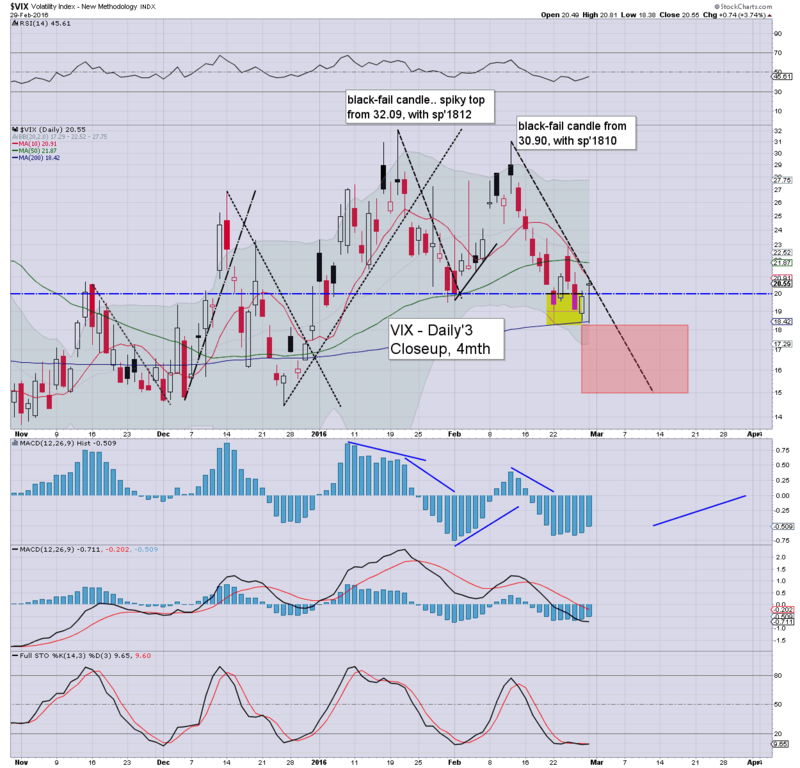 That is naturally helping the miners, with GDX +3.3%. 3.19pm... Hmm..... marginally interesting.. with sp -13pts @ 1934. Seems there is some sell side into end month. Some of the 'smart big money' wants to cash out after what has been a sig' bounce from 1810. In any case...still seeking renewed upside. 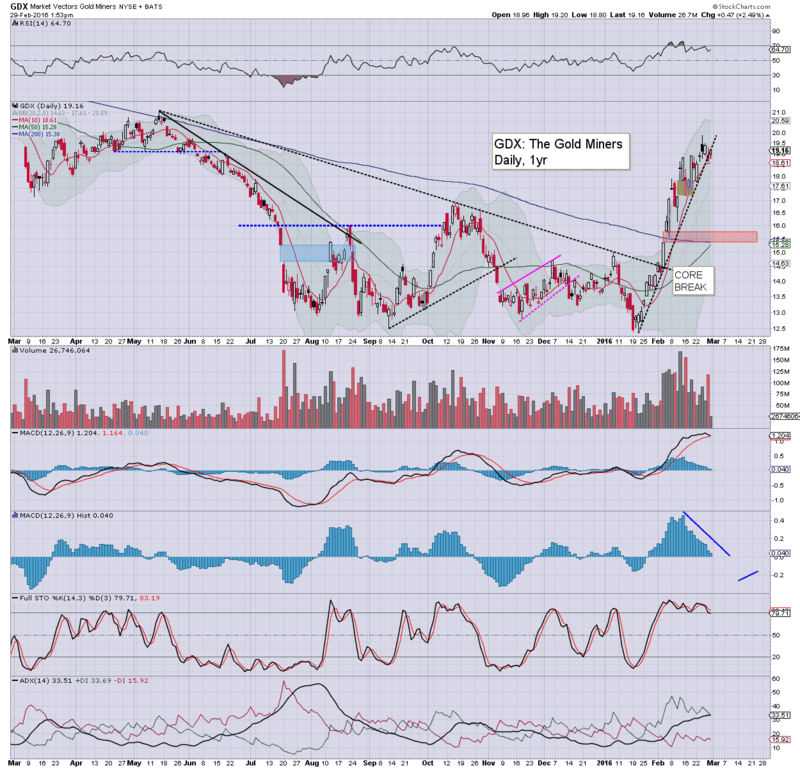 Gold +$14... making for a powerful net monthly gain.... as the miners have also attained. US equities remain leaning on the positive side, with the sp +3pts at 1951. 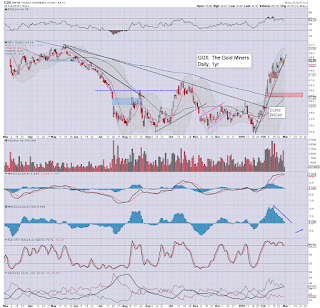 The 1965/75 zone looks highly probable within the next few days, with 2K more viable next week. In either case, equity bears don't likely have any realistic opportunity until after the next FOMC (March 16th). Little to add.. on what is an increasingly subdued day. Clearly, equity bears have no downside power. Its just a case of how high we can climb into mid March. 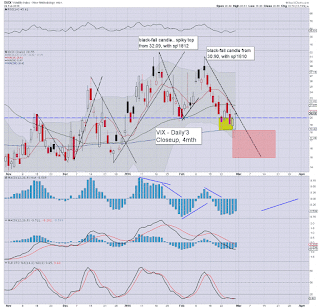 Set for a net daily gain of 2-3%, and currently +34.8% for the month. US equities are battling to hold minor gains, with the sp +4pts @ 1952. 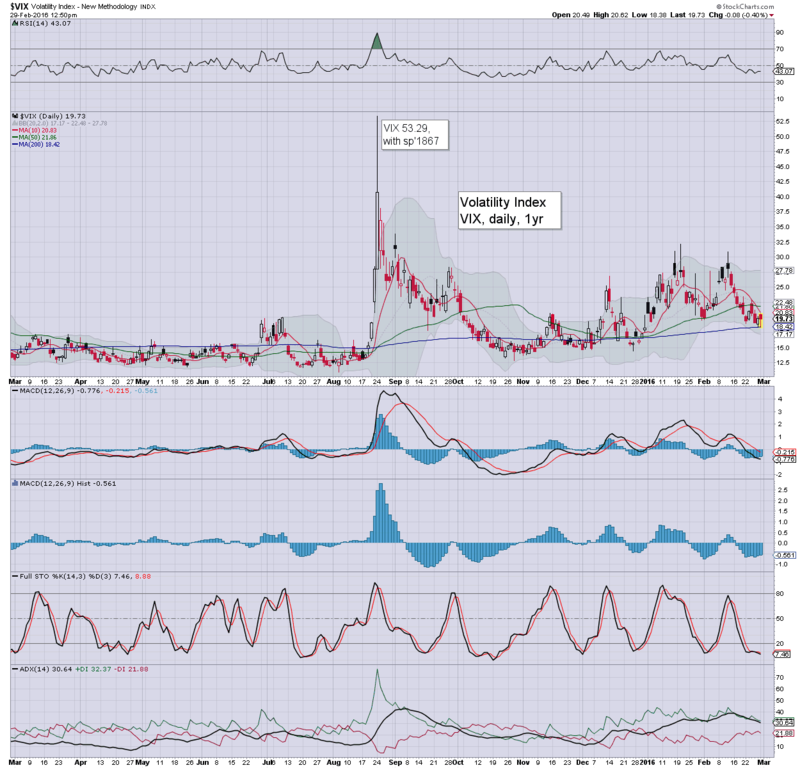 VIX remains broadly subdued, remaining under the key 20 threshold. If sp'2K or higher, the 16/15s look viable by mid March. Oil continues to help market sentiment, +2.5% in the $33s. Seen on the daily charts, today is indeed very inconsequential. Price action clearly favours the bulls, as the bears continue to look exhausted. .. but both of those remain as devastatingly low levels relative to summer 2014. 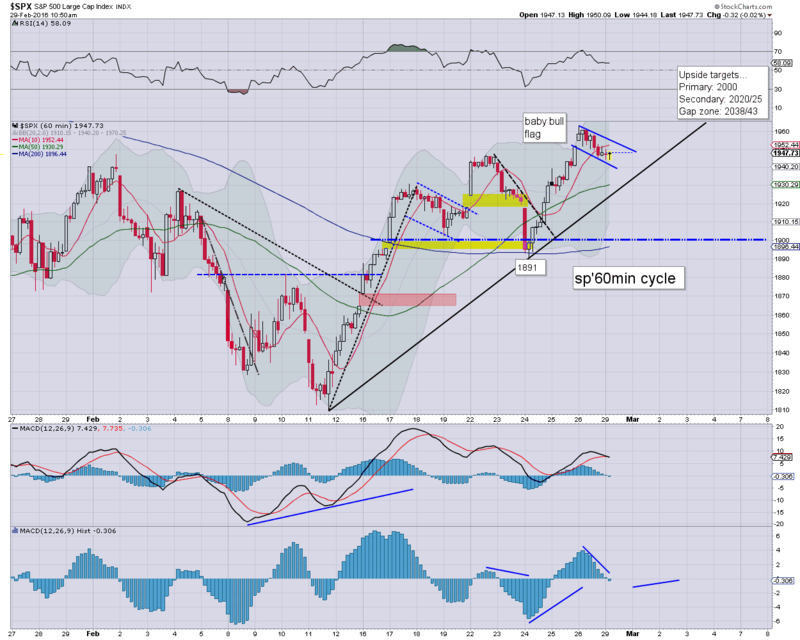 US equities are clawing upward, with a break above the baby bull flag. 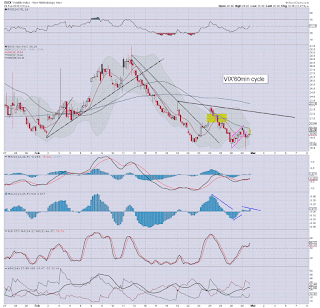 There is open air to the sp'1965/70 zone, along with VIX 18s. The precious metals remain moderately higher, Gold +$8, with Silver +0.7%. Oil is certainly helping the market mood, +2.0% in the $33s. *note the new cycle low of VIX 18.38, although its arguably a 'rogue print'. Suffice to add...for the more patient out there, its a case of sitting back for another 13 trading days (including today). A high at the next FOMC (March 16th) would seem a very natural outcome. US equities remain in minor chop mode, as the equity bears lack any sig' downside power, despite another recessionary (Chicago PMI: 47.6) econ-data point. Metals are holding gains, Gold +$9, with Silver +0.6%. Oil is +0.6% in the 32/33s. Price structure on the hourly equity cycle remains a clear baby bull flag - with a corresponding baby bear flag on the VIX hourly, and I do expect a bullish equity upward break, whether late today or tomorrow. 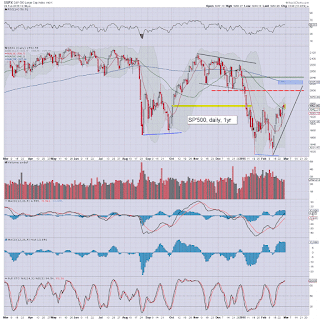 Broadly... the 2K level looks rather straight forward..and it certainly doesn't have to hit this week. ... and with March tomorrow, early summer warmth is maybe just 6-7 weeks away. Thank the gods. US equities open with very minor price chop. It should be clear there is hardly any downward pressure, and underlying price pressure remains to the upside for another few weeks. Metals are building gains, Gold +$9, but still appears broadly vulnerable into mid March. *Chicago PMI: 47.6... lousy, and that IS a recessionary number. Note the MACD, now in the -4s.. from -8s. A bullish cross will be viable next Monday.. or at the latest, Mon' March 14th. Good morning. US equity futures are a little lower, sp -5pts, we're set to open at 1943. USD is +0.2% in the DXY 98.30. Metals are moderately higher, Gold +$7, with Silver +0.5%. Oil is +0.2% in the $32s. *awaiting Chicago PMI data. Market is expecting 52. Last month saw a bizarre spike reading of 55.6, which made absolutely ZERO sense at all. 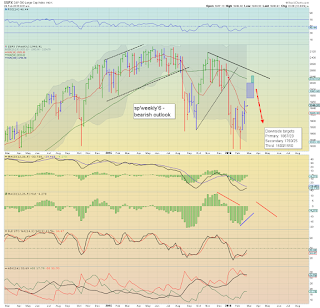 Equity bears should be seeking anything under the recessionary threshold of 50. Well, its leap year day.... the end of the month. Indeed, the monthly closes will be important. I will have eyes on the opening MAs tomorrow morning, and expect the monthly 10MA to drop to around sp'2K. I could tolerate a brief foray to the sp'2020/40 zone in mid March.. but equity bears MUST see a close below it. As for today.. I'd expect another daily close above the 50dma... with the market headed to the 2K threshold. As ever, make of that, what you will. I sure don't agree with some of it.